As I sort through the books in the library of le petit apartment, I feel emotionally drained. In addition to supporting a family, performing full time work and nestling into a new volunteer role, I have let this project take over a month and will likely let it drag on through the summer. I am letting it prepare me for a quest that is doubly draining and has suffered from my procrastination. 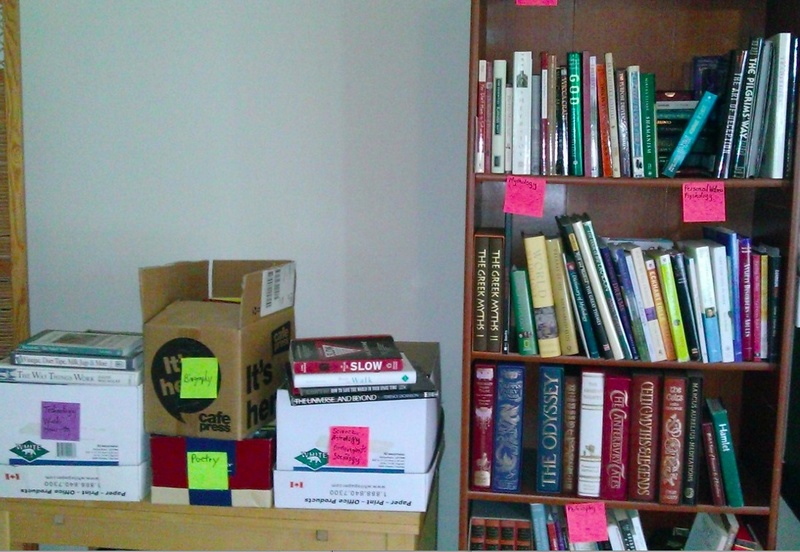 It’s a daunting task to sort and justify keeping or discarding books. Some brought joy, inspiration and comfort. They are like old friends. Some brought knowledge and helped build skills. Some skills are transferable; some are no longer applicable in today’s job markets. I think back to 20 years ago, to my foray into dialup connectivity, HTML web design and website usability. 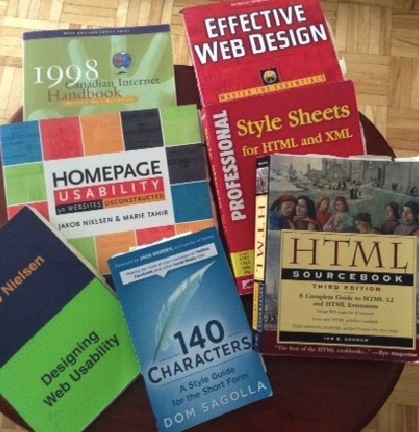 While I balanced family, work and survival, these books challenged my creativity, nurtured my fascination with hyperlinks and supported my appreciation of online communities. The concepts in some of these books could still apply while some have been left in the dust due to fast-paced development and evolution of technology. Do I keep them out of nostalgia or donate to the community? Will they even be of value to somebody else? Then there are the books that reinforced my love of nature, justified a moderately paced life style, and encouraged one to take action in preserving this earth for future generations. We can’t give up. Next time: We look at Biographies and Poetry. Thanks for dropping by. What are you struggling with in your personal library or de-cluttering projects these days? If you need a distraction from your projects, you can read the novel I wrote under my pen name. 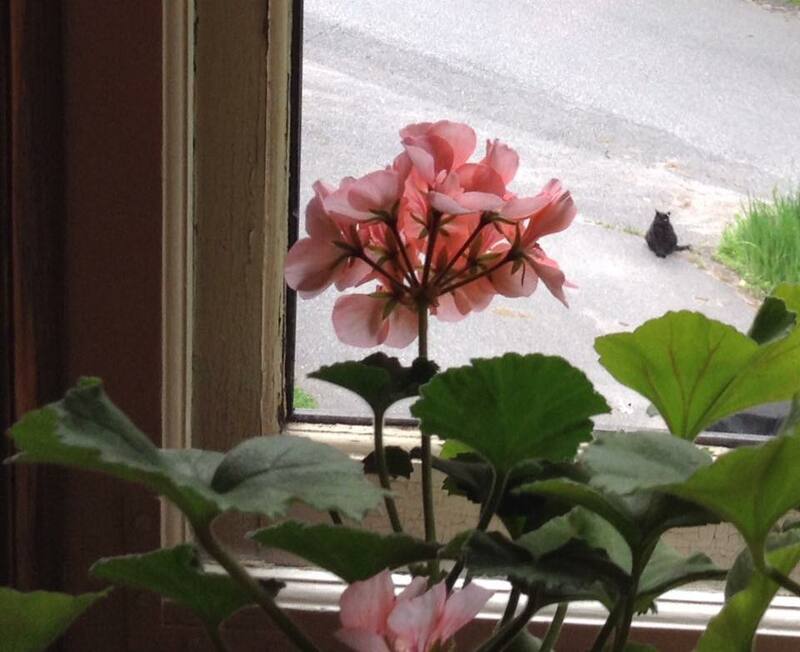 Flo is old school but she’s getting hip to the ways of Twitter. Please visit Smashwords to download a sample of the e-book for The Year of the Rabbit. You could choose to purchase a copy. It’s only 99 cents or you can pay what you feel is a fair price. It’s okay, I wrote it mainly to share a story. Some people liked reading it. If you enjoyed the novel, please mention it to others. Although it is not quite the same, may you be spared the emotions of sorting through your e-book libraries one day. Last summer, I travelled to meet my four older sisters during a pilgrimage of sorts to our Mother’s place of birth. Last month, I travelled with my oldest son to mine. Our journey was a combination of planes, trains and automobiles. We got along well for most of the long weekend. We had budgeted well for comfy travel and a three night stay at a lovely Bed and Breakfast. It had been many years since I spent more than one or two nights in that small town other than to attend weddings or funerals. This time, the occasion was a family reunion being held in an eatery along the main drag. Prior to catching up with the twenty or more people who attended, my son and I had plans to play tourist for a couple of days. Well, I had plans. He was along for the ride. 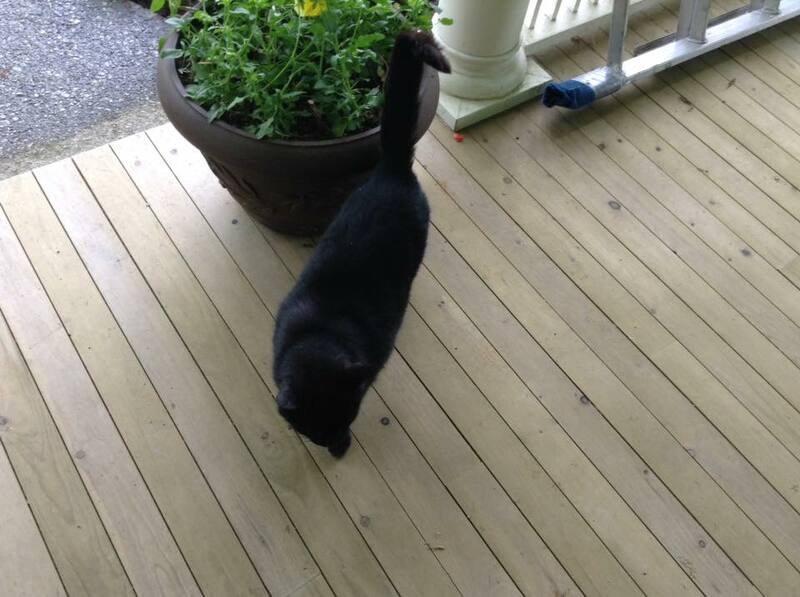 The first day, a neighbourhood cat greeted me during his morning tour while I took in fresh air on the B and B’s front porch and waited for the coffee announcement. 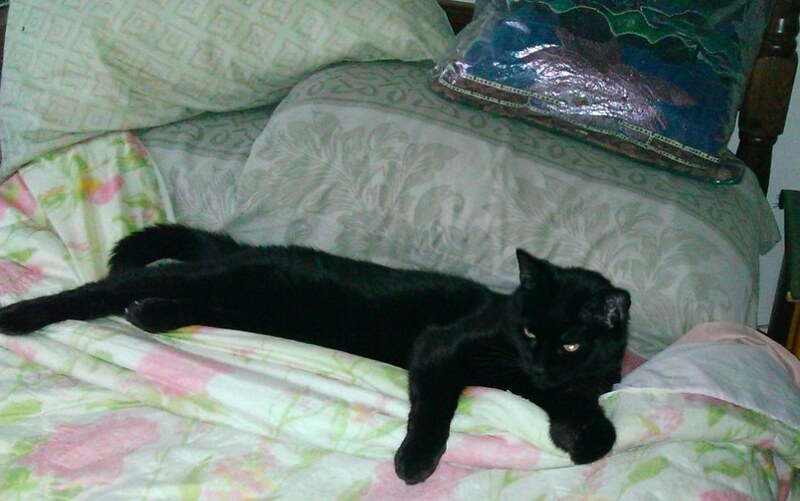 I was happy to meet a black feline who reminded me of one of my own back home. He was a very friendly fellow with all the purring and rubbing but wouldn’t stay still long enough to look at the camera! He had an outdoor cat coat which was much coarser than that of Mr. Snuggles. 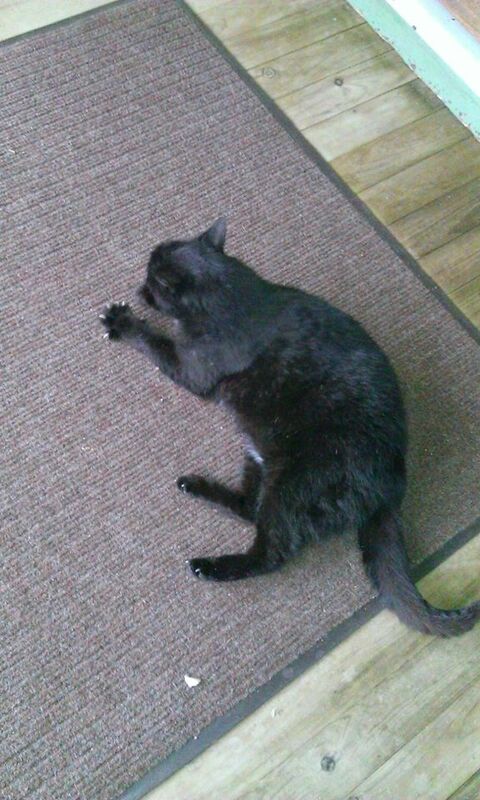 He also had well-sharpened claws which made it difficult for lap sitting. After breakfast, my son and I went for a walk with intentions of visiting the used book store and a few other places. 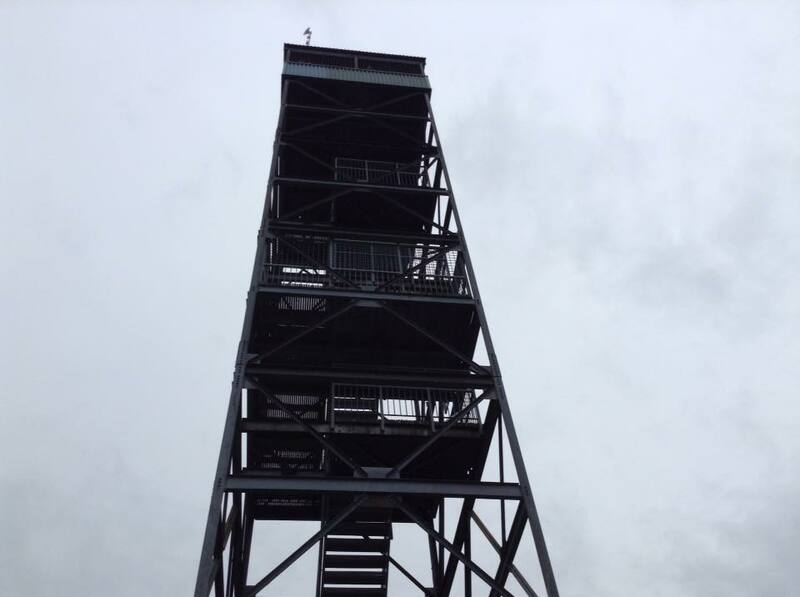 He sighed when I indicated a plan to take on that lookout tower on the opposite hill. We shall venture to that tower on the hill this weekend! I reminisced beside the lazy river that meandered through our old town. In my early days, I used to paddle a canoe up and down that river, exploring the shores and meeting friends. 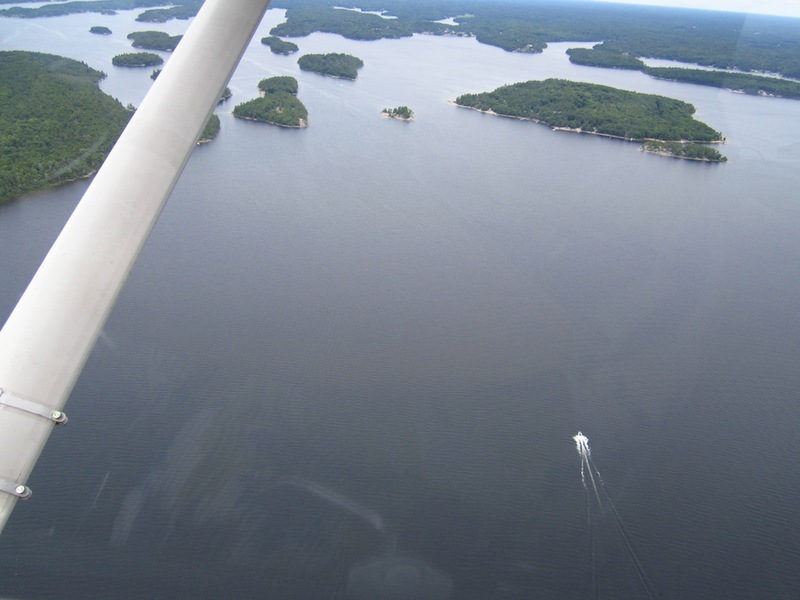 On an impulse decision, I agreed to a 25-minute float plane tour of Georgian Bay rather than a 3-hour boat cruise. 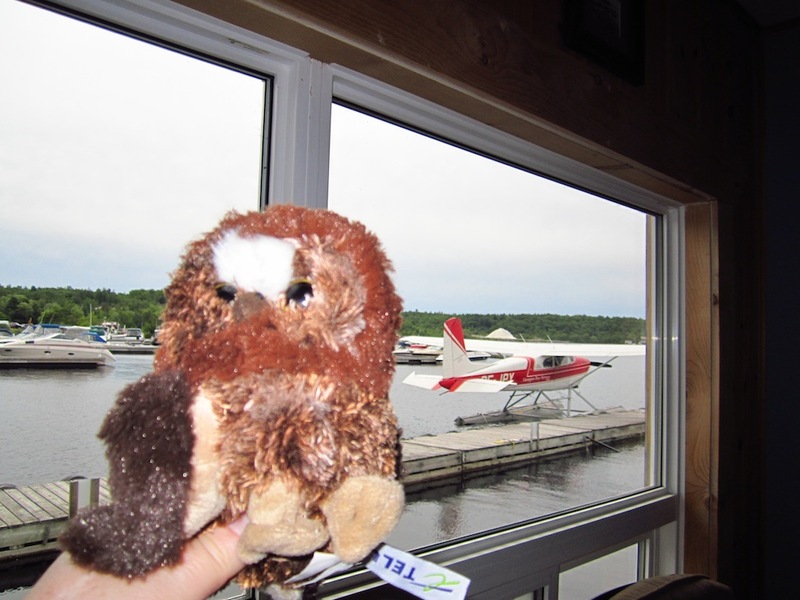 My other travel companion was excited about the chance to take to the air. 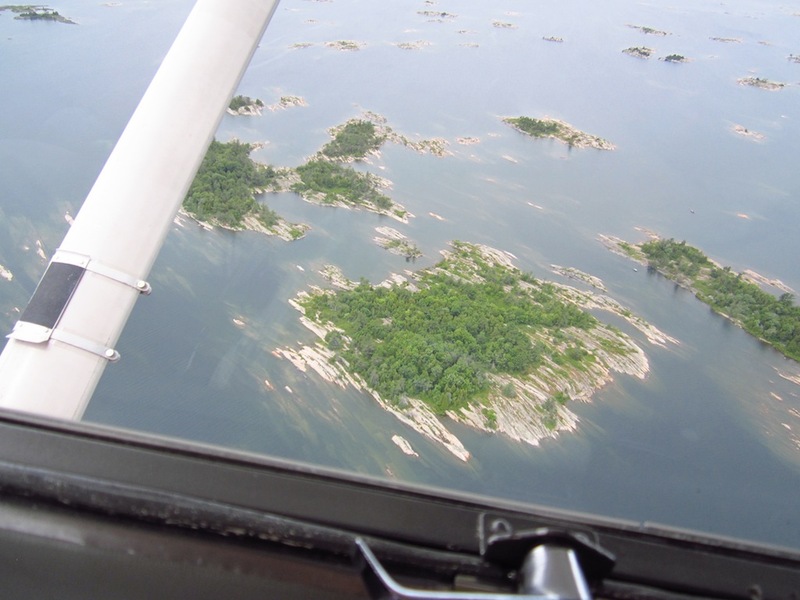 The airways tour was exciting and beautiful, providing a quick aerial view of Georgian Bay. I made sure to snap plenty of pictures with my trusty little camera. This wasn’t the first time I used it to calm my anxieties about flying in a small plane. 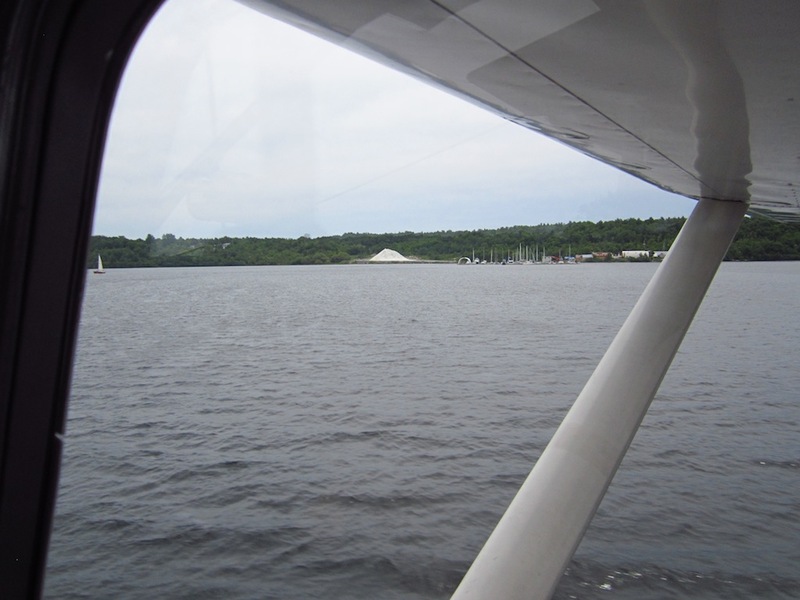 Before we knew it, we were approaching the harbour again. 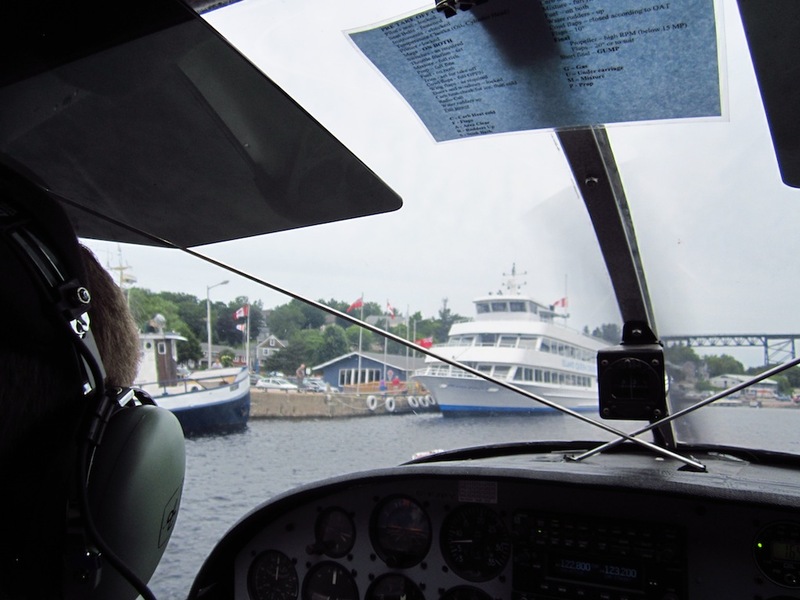 We made a very smooth landing then puttered back to the docks. The next day was rainy and breezy. We applied appropriate footwear and an extra layer of clothing to walk around the old neighbourhood and climb tower hill. I felt obligated to provide proof to family and old friends that we had visited this landmark. Although I had been up and down this structure many times in my youth, the rain, wind and my weaker knees made it a new experience that day. 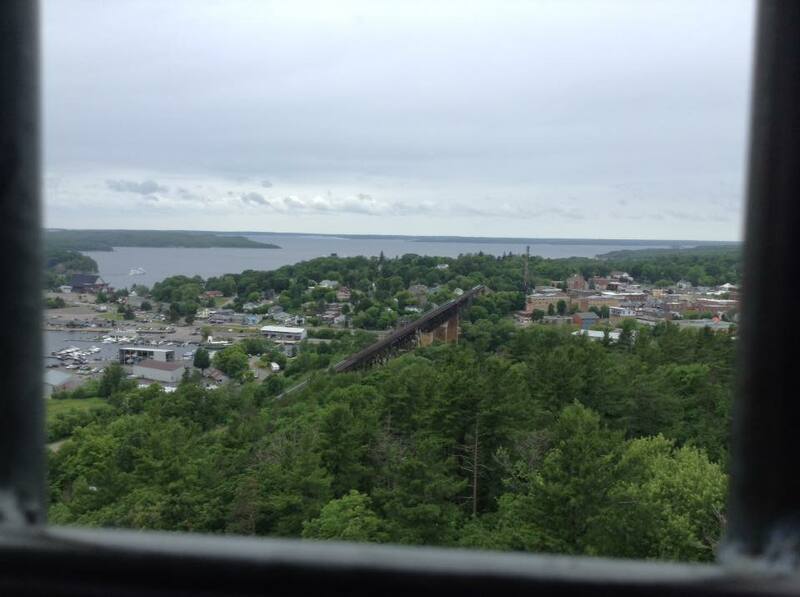 You will notice the CPR train trestle appears in many of my touristy photographs. 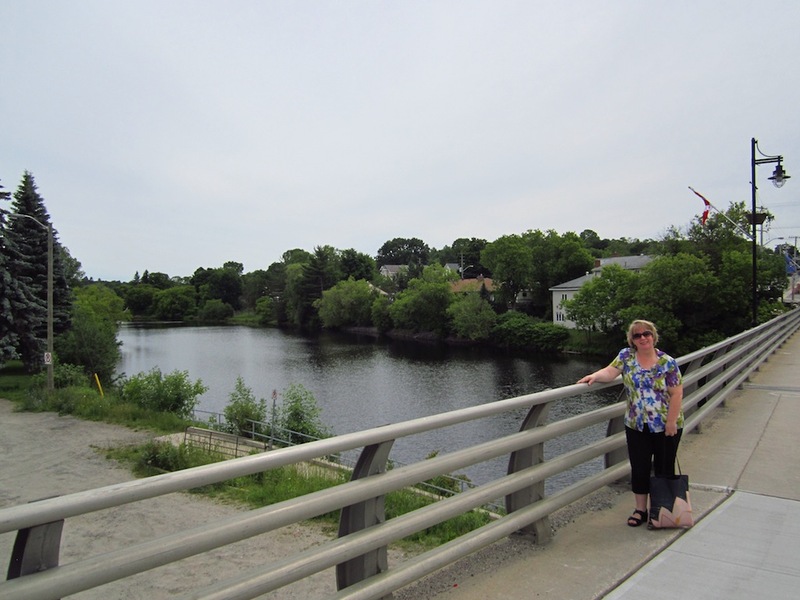 It was an ever-present landmark looming over our old neighbourhood and spanning the Seguin River valley. Many others will agree that since we were surrounded by the CPR and CNR routes, trains were a big part of our childhood. During my recent visit, I found the frequent sound of the train whistles comforting and nostalgic. After three days and nights, the charm soon wore off. 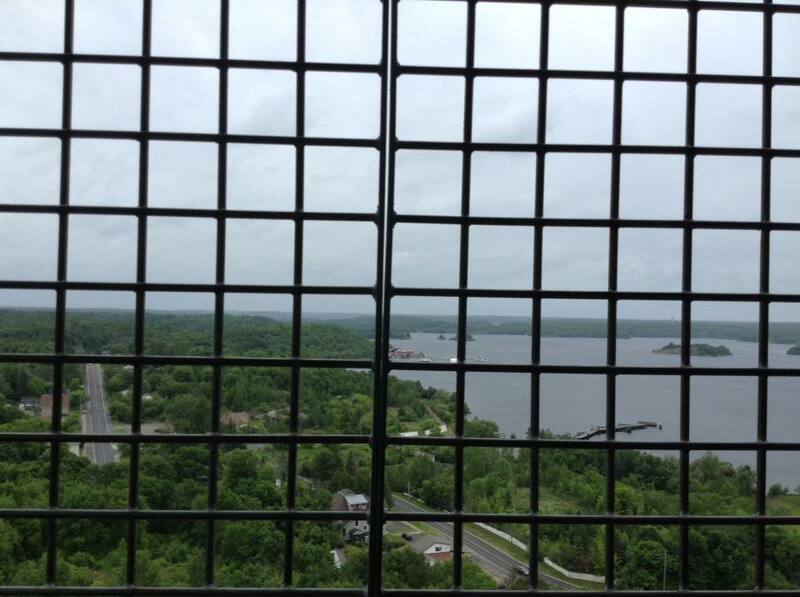 Meanwhile, back at the top of the windy lookout tower, we quickly scanned around to confirm there were no forest fires then gingerly made our way back down the see-through metal steps. Conveniently, the Tower Hill museum and gift shop were open that rainy Sunday afternoon. We only had enough time to purchase souvenirs then go in search of lunch. 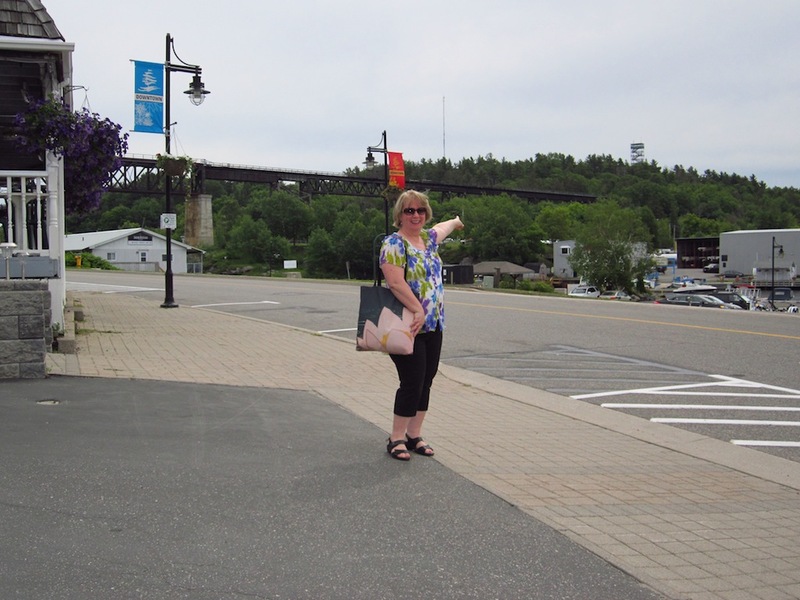 I insisted we visit the restaurant that provided inspiration for The Red Hare in The Year of the Rabbit, a novel that took place in a small town very similar to Parry Sound. 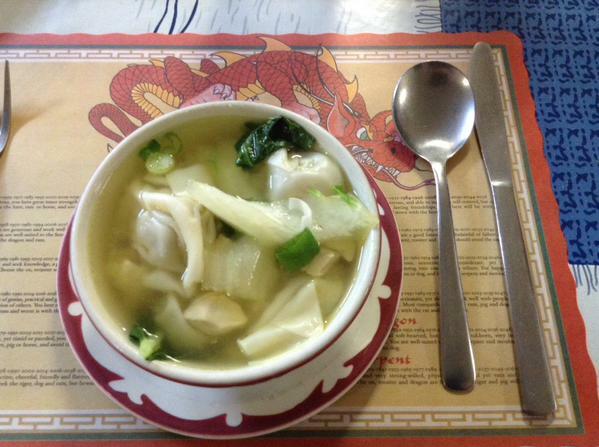 The bowl of hot wonton soup was very comforting. When we returned tired and wet at the Bed and Breakfast, we were greeted by that neighbourhood cat. 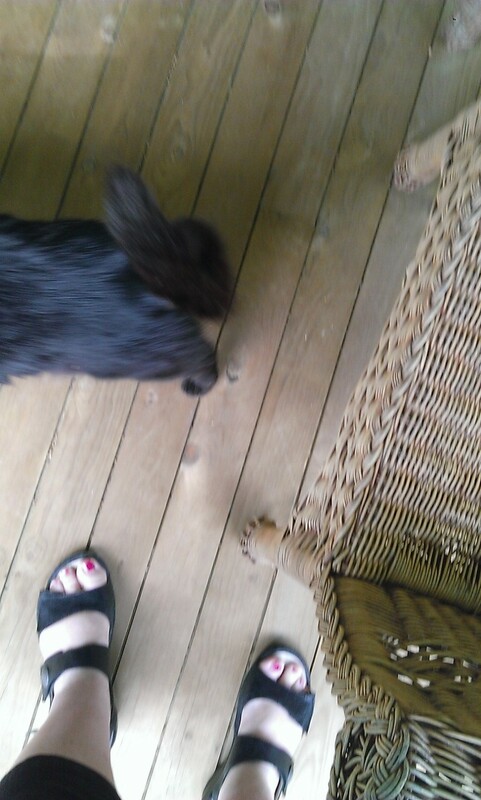 Once again, I could not convince him to stay still in order to get a good profile pic. Third time’s a charm, he appeared on the morning of our departure, likely to see us off – or request a chin scratch and tummy rub. After a long journey of sitting, waiting and connecting, we arrived home. I was happy to see my other children. Some were happy to see me too. I have settled back in to my weekly routine. 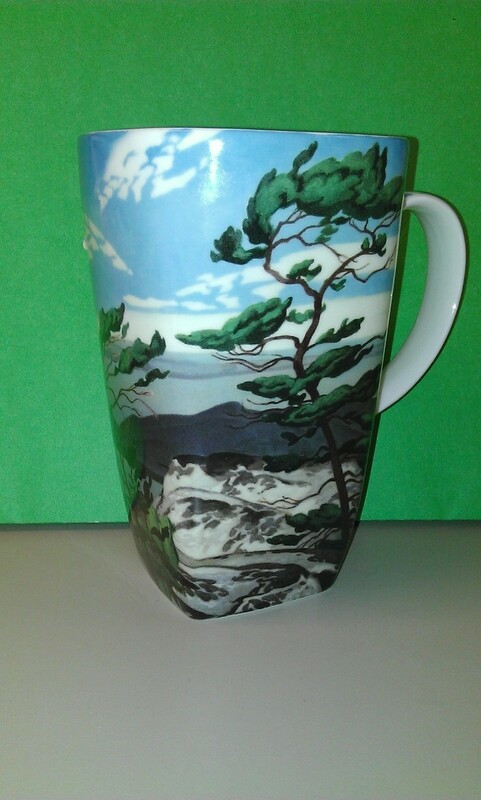 I can reminisce about the visit and the brief family reunion while I sip cool water from my souvenir Macintosh Grande mug graced with the lovely Casson “White Pine” painting. Thanks for dropping by. If you’re feeling adventurous to read that novel I mentioned, please visit Smashwords to download a sample of the ebook or eventually purchase a copy. It’s only 99 cents or you can pay what you feel is a fair price. It’s okay, I didn’t write it to make money, only to share a story. If you enjoyed it, mention it to others.